Welcome Thank you for visiting JeepneyRecipes.com. You can opt not to share us your information, but then you may not be able to take advantage of some of the website's features. The Site may use cookie and tracking technology depending on the features provided. Cookie and tracking technology are useful for gathering information such as browser type and operating system, tracking the number of visitors to the Site, and understanding how visitors utilize the Site. Cookies can also help customize the Site for visitors. Personal information cannot be collected via cookies and other tracking technology, however, if you previously provided personally identifiable information, cookies may be tied to such information. Aggregate cookie and tracking information may be shared with third parties. Our website may incorporate links to other websites of interest. However, once you have used these links to leave our site, you should note that we do not have any command over that other website. Therefore, we cannot be responsible for the security and privacy of any information which you provide whilst visiting such sites and such sites are not governed by this privacy statement. You should exercise caution and look at the privacy statement applicable to the website in question. Your personally identifiable information is kept confidential. All emails and newsletters from this site allow you to opt out of further mailings. 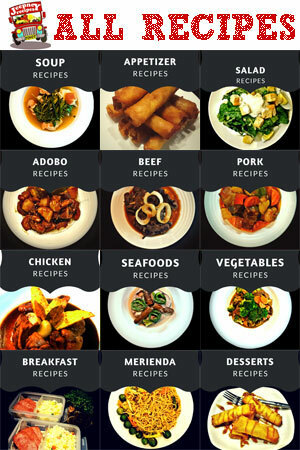 Jeepney Recipes does not knowingly collect any personally identifiable information from children under the age of 13. If a parent or guardian believes that this website has in its database the personally-identifiable information of a child under the age of 13, please contact us immediately at jeepneyrecipes@gmail.com and we will use our best efforts to promptly remove such information from our records.